Sec. Mark Villar, through his media officer, said DPWH to build bridge in Iligan after seeing viral video. On 14 November 2016, MinYas Mangorsi posted a Facebook video showing two schoolchildren crossing an improvised bridge on the way to school. 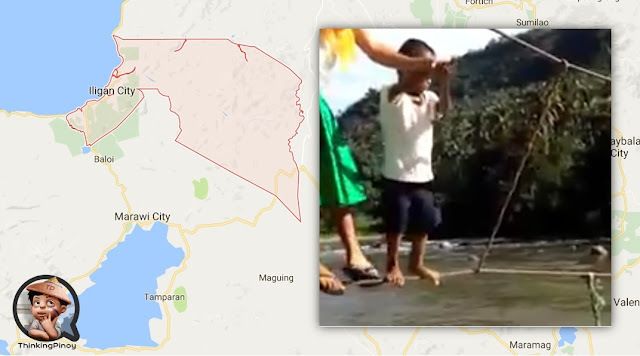 The “bridge”, situated in a rural part of Iligan City in Mindanao, was just a pair of ropes held up by wooden stilts, over a raging river. The two kids face mortal danger as they pass through this flimsy structure every day. The video quickly went viral after it was reuploaded a day later by digital activist Mocha Uson on her Facebook page, with a total of 2 million views so far. Now, if you've been following the ThinkingPinoy Facebook page, I interviewed Public Works Secretary Mark Villar on 04 November 2016, so I maintained contact with DPWH since then. On the same day Mocha Uson reposted the viral video, Sec. Villar’s media officer Anna Mae Llamentillo (DPWH) messaged me. DPWH: Mocha posted a video of kids. Would you know location? Could I get her contact details? I showed Sec. (Villar) the video. We at DPWH can help. And there I was, amazed by the idea that social media is real. But wait! There’s more. Just tonight, DPWH’s Llamentillo messaged me again to give an update. Llamentillo said they already are in the process of securing permits. DPWH: GMA reported about it [GMA] and Ivan Mayrina said he wasn’t able to get a statement from the LGU so we just assumed responsibility. Sec Villar said we can just take the initiative and do it. Llamentillo said they will construct the temporary bridge in as early as December, with a long-term, sturdier bridge to follow.